Not to be confused with "Cleopatra" (either the 1963 epic, or the girlband), this is the 1945 Technicolor film version of George Bernard Shaw's play of 1901. It's rather playful and camp and only gets boring about two thirds of the way through. I was disappointed to see that Marc Anthony (not to be confused with ex Mr J-Lo) is talked of as having strong, round arms and yet you never see him. That's a major flaw, Bernard Shaw. What else can one do on a Saturday afternoon when a cold is producing prodigious amounts of mucus and needs a cushioned toilet roll close by? Youtube, these days, has lots of full length films. Free, and legal. It almost feels virtuous. Vivien Leigh, who was around thirty, is a kittenish, skittish Cleopatra who, presumably after some off-camera attention from Caesar, becomes a proper grown up cat. The queen-in-a-carpet set piece is carried off with strapping delight by Stewart Granger (Apollodorus), covered in Bisto, and wearing an orange mini dress and one gorgeous drop earring. If I read the code correctly, the fact that Cleo is wearing a red sash around her pale frock at this stage means she is awake but still not fully up. Later, she wears a lovely womanly claret which is obviously shorthand for "they have now done it". I'm not sure what Granger's orange frock is meant to signify. Given that he is by far the most attractive man in the film, and yet is not treated as a rival for Cleo's affections by Caesar, one might draw the conclusion that he was not really into that sort of queen. 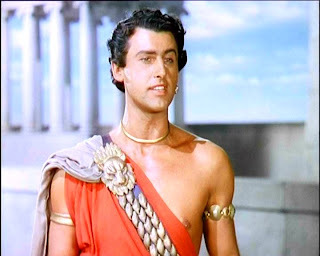 Caesar is played as a phlegmatic and gently humorous middle aged man by Claude Rains but he seems a little overshadowed by Leigh's untouchable (or very touchable if stories are to be believed) beauty. So astonishing is this woman that she stands next to a very young Jean Simmons who is playing the harp, and you barely notice Jean. I think it was incredibly fortunate that Romans and Egyptians alike spoke painfully elocuted BBC English. I always wondered how people communcated in those days. Lovely film; mainly due to the wonderful script. "Apollodorus: you are my perfect knight; and I will always buy my carpets through you." Cast: Claude Rains, Vivien Leigh, Flora Robson, Stewart Granger, and loads of other people.